RECOMMENDED - Google Inbox Replacement - light a Spark right away! With the announcement that Google would be shuttering Inbox, there's been a lot of articles about what to use as its replacement. I've pretty much been living in web mail for the past few years - but on my iPhone and iPad, it's been a bit of a toss-up. Mail on my MacBook Pro hasn't worked properly for months now (and solutions never worked properly) so I figured I would use this as an opportunity to find a better solution overall. Spark is an email client for iPhone, iPad and Mac OS from Readdle. I started with it on my iPhone, evaluating a few other alternatives but what sealed the deal for me was its clients for the Mac and iPad. Spark has a "Smart Inbox" which combines multiple accounts into a single inbox, making it easier to stay on top of all your mail. Since the feature was offered, I've been using Gmail with its support for multiple email addresses but some mail clients don't support it easily. Spark handled it without a problem. Mails can be pinned as well as snoozed ( a feature I used often in Inbox) and all of your existing Gmail filters (rules) are still left intact. 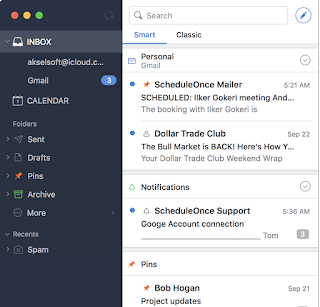 It felt like an awesome mail client but then I discovered its other great features. When sending an email, there's an option to remind you if you need to follow up on it later. There's also an option to "Send Later" which is great for scheduled emails. An email can be "exported" to other services including Reminders and Trello. When a message is exported to Trello, it can be added to any of your boards. I don't use many of the services listed but with support for Evernote and OneNote, Spark should cover many favourites. I hope they add Pocket soon. Emails can also be generated as a PDF and stored to popular cloud services including Dropbox and Apple Files. Files from these services can also be attached easily. One of the features I've enjoyed recently in email clients are automatic replies. Spark's Smart Replies let you add your own and easily insert them when needed as well as Signatures. When moving to a new client, it's often frustrating to learn new keyboard shortcuts. Spark has that covered with separate keyboard maps depending on which Account you are using. From the list, an Active set can be chosen. While I don't use gmail's keyboard shortcuts, it's certainly popular for some and it's nice that you won't lose them. So it's a mail client...and it's free. Great deal but where Spark adds surprising functionality is with its Teams functionality. Team functionality does require a subscription but makes collaboration part of your email experience. Shared draft emails is such a cool feature, especially when responding to proposals or important marketing messages. I get frustrated when I receive an email from a company where the actual response is in an attachment, obviously crafted by a team of people. I don't care who wrote it - just put it in the email. With Spark Teams, there's really no excuse for it. Emails can also be linked to in external documents. Click the link and Spark opens the email directly. This works across devices as well. Speaking of devices, I've never been a big fan of Apple's Mail support on the Apple Watch. Spark's implementation is super clean, showing counts of types of emails at a glance. While Teams is a subscription based tool, it does require that everyone buy into Spark as a solution. This can be tricky, unless you can enforce it top-down. ReAddle offers a number of other products, that individuals may find useful as well - a PDF editor, improved calendar and Scanner. So with any company offering a free product, my concern immediately jumps to how they make money. Why is that important? Google offers free email - imagine what would happen if they decided to shutter Gmail. That could never happen, right? Well, they just shuttered Inbox. In fact, Google could be cited for the number of its own products or concepts that it has shut down over the years. ReAddle doesn't have a great record either but rather than hide it, they advertise it. It's an interesting approach but it also shows that they do recognize what has gone well and what hasn't. The fact that they've been around since the iPhone launch in 2007 DOES say a lot about the company. 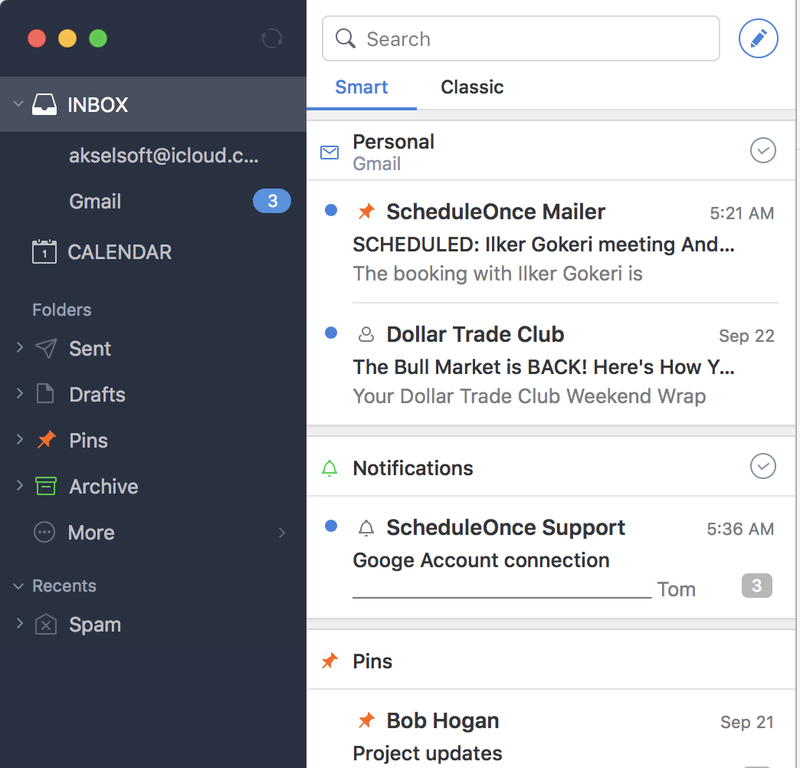 If you are looking for a replacement for Inbox or even just looking for a better email client, take a look at Spark - I think you'll love it. If you do use it, what features do you like? There are lots of devices available for a Smart Home. The Nest thermostat was one of the first that truly ushered in the current batch of tools. Sure, before that, you could use X-10 to automate as much of the house as possible and there were always custom solutions but the current idea of the automated home made it feel so much closer to reality than ever before. I have a Nest thermostat as well as a Nest Protect. When Nest was purchased by Google, I was excited about the possibilities but then discouraged by the founder leaving. But still there was a lot of promise in other areas. I purchased an outlet switch at the Apple Store for an iDevices switch. It worked as a HomeKit device. We used it for patio lights and they worked amazing. They offer an Foundation Kit which includes two plugs and an outside adapter. ALMOST a perfect fit. I did have some troubles with the outside adapter communicating with our at home network. Company sent a new one after a number of troubleshooting episodes. End result? Outside adapter for the win! Christmas lights are no longer an issue. WAIT - surely, we could have been using one of those dusk-to-dawn dimmers for outside lights and in fact, we have. They work great - but when they get buried in the snow and you want to change them, the trouble isn't really worth it. Cue the stories of how spoiled the current generation is. It's not enough to have to turn on lights, you have to turn them on from inside. Don't want to put up lights? Buy one of those outside laser light shows. But seriously, it's not just a geek thing - if you can do it and it makes your life better, why wouldn't you? So when iDevices introduced their new wall switches, I knew I had to try them out. At $99, they aren't cheap. I was able to purchase several during various sale periods, reducing the price to about $75 but dealing with duties, it brings it back up. The competition is getting fierce as well. Non-HomeKit devices can be fifty dollars cheaper and even the Eve and Koogeek switches are cheaper. I don't know if there are problems with mixing and matching switch devices but I do know consistency in a home is important. While we may use other devices for different parts, I would like the overall home to look the same. The other thing I really like about the iDevices switches is the nightlight feature. They have a small strip in the middle of the switch that can change colour as you choose to fit in with the wall colours or other decor. They are also close to flush against the wall. iDevices aren't strictly HomeKit either. While they have their own app, they are also Google and Alexa compatible. Of course, it now sounds like we have a full house ("Siri, turn on downstairs", "Alexa turn on the backyard") - but unless Apple figures out how to offer an affordable HomePod in Canada, Alexa is the best go to (disclosure - I haven't tried a Google device yet). Cross system compatibility is really nice while the entire home automation market tries to establish clear winners. 1) they don't work well with certain mesh devices (I have an Orbi). A firmware update caused my lights to turn on and off sporadically so I reset it back to the older version - problem solved. Before buying, check the compatibility list. 2) the dimmer and single switch aren't compatible. When you have a three way switch (two switches that control the same light), you have to have the same type of switch for both switches. What makes this troubling is that they recently introduced a new "child" device called the Instant switch which links to existing plugs. That switch doesn't have the nightlight feature - so you can't really use it with the same look as the others. They should offer an option on this that doesn't have the nightlight to address the complaint as well as a nightlight option. The iDevice family is pretty close to all encompassing: wall outlets, wall switches, wall plugs (indoor and outdoor) and thermostats (at one point, they offered a Shower and Grill piece but they weren't really HomeKit devices). My wish list includes USB switches or perhaps an extension strip. By focusing on the key home areas, rather than trying to deal with the whole health aspect, I feel very comfortable in using iDevices as a base for my home automation framework. I hope their prices do come down a bit so I can finish off the rest of the house but I can still wait for the sales or better combination packs. After going through so many winters and paying for snow removal, I had had enough. I had slipped on the patio steps more than once - even once laying right on my back. I searched Amazon for some heated mats and initially only found products that had really bad reviews. Then I searched outside of Amazon and found Heat Trak. The reviews looked promising and while the return policy included a 15% restocking fee, I ordered a few just to try them out. If they worked, great - if not, I would only use one and return the others. First time we used them, there was no snow but it was cold. We had people over and when they went outside in their socks, they were loving it - no boots needed!! Here's a link to the company web site - definitely worth checking out. They also have some more industrial mats that are better for driveways but they are a tad expensive (>$1000).